Have passed the courses of Research Methodology with a minimum value of C.
Before submitting a thesis title, students must complete the academic and administrative requirements. Before submitting a title, students can do some preliminary research (pre – research) if necessary. Filling out the form of Proposed Thesis Title to the head of study program. Based on the evaluation, the head of study program issued a proposed thesis title that is approved by the Supervisor Commission. Fields of study that can be examined are all things associated with English language and the teaching. Students request for the schedule form / card of the thesis guidance to the head of study program. Afterone of the alternate titles is approved by the head of study program, students mustprepare and submit the research proposals in accordance with the approved title to the Supervisor. Thesis writing performed by students is under guidance of faculty supervisor. Supervisors consist of the first supervisor and the second supervisor. The first supervisor has the ultimate authority in all matters dealing with the counseling process including the authority to change the title if necessary. The second supervisor assists the first supervisor in implementing the guidance. Educated scholar Strata III (S3) and have achieved academic hierarchy as low as expert assistant and have served on UBL at least 1 (one) year. The supervisor has a relevant skill with a problem / topic of the thesis written by the students supervised. The Implementation of thesis guidance is done at least eight (8) times of the intensive consultation with the supervisors. The Implementation of thesis guidance is stated complete after the first supervisor gives an approval to be published / printed. The Implementation of thesis guidance must be completed no later than 365 days (one year) from the date of the enactment of the thesis title approved by the Supervisor along with the head of study program. Students failed to complete the writing in this period will be subject to sanctions by the rules set by the head of study program. Students are not allowed to change the supervisors without the consent of the head of study program. Supervising faculty members who are for some reasons are unable to remain andto provide further guidance shall notify in writing to the head of study program. The supervisors who are legally and convincingly proven to be the cause of a student that cannot meet the requirements in point (e) will be reprimanded, warned, or replaced with other supervisorscommission by the head of studyprogram. The Supervisorshave a right to refuse the designation in consideration of science specialties practiced. After obtaining a title approval and a thesis supervisor from the head of study program, students shall see the first supervisor for instructions and/or direction on the implementation of a guidance. Students must show the title approval letter and the supervisor determination, research proposal, and the schedule form / the card of thesis guidance. If based on the guidance of the first supervisor students have to do major changes to the title and or the object of research, students must report the change to the head of study program. If the title of the research is approved by the first supervisor, the process of the implementation of research proposals is submitted to the second supervisor at the direction of the first supervisor. The research proposals that have been approved by the second supervisor are handed back to the first supervisor for review and approval from the first supervisor. Once the research proposal is approved by the first supervisor, studentsare allowed continuing the next guidance of the thesis material. For further thesis material guidance process, students must first consult to the second supervisor. 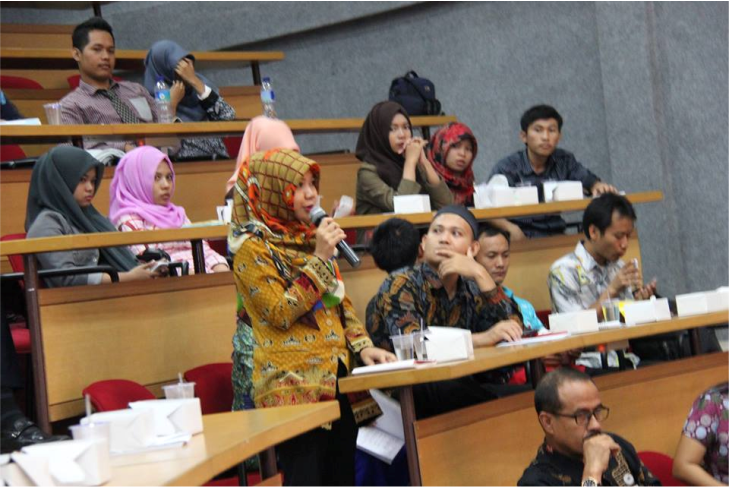 Once the material is approved by the second thesis supervisor, then students must consult to the main supervisor. In each consultation to the faculty supervisor, students must carry the card / the schedule of the thesis guidance. The supervisor testifies the result of his guidance and his signature on the card / the schedule of the thesis guidance. The thesis is declared ready to be tested once it had obtained an approval from the supervisor. Furthermore students have to bring the card / the schedule of the thesis guidance to the head of study program for approval. The Research title page contains: a title, an author name, an NPM, a Study Program, a Faculty, a University name, and the year of proposal writing. Clearin meaning, it means that it shows clearly and unequivocally on the relationship between variables (modifiers) that are studied and are able to describe the core of the research. Complete, it means that it describes all variables studied as well as the object and the location of the research. Informative, it means that it is easily understood by every reader, and it is unambiguous. Short, it means avoiding the use of unnecessary words. The nature of the background is to show / explain / describe the importance of variables examined in the context of the research object. A general description on the importance of the research in the context of the specific scientific study field (specialization). A description on the importance of the variables studied. Data / information / conditions / facts about the variables studied on the object under study to be delivered on an issue. Contents: an inventory of problems associated with the study variables on the object under study. Based on the results of the inventory, the problem is formulated in a question form (?). The Research objectives should be formulated with reference to the problems that have been formulated. To determine the condition of existing variables on the object of the research (descriptive). To determine the relationship (the influence, the roles, the relationships, and so on). To determine the alternative solutions on the object of the research. To determine the steps problem solutions. A Hypothesis is a temporary answer to the problems that have been formulated. It serves as a guide to provide direction and guidance for the research to be conducted. Formulation of hypotheses should refer to issues that have been formulated and the research objectives that have been determined and shall be based on a theoretical framework that has been presented. A Theoretical framework should be prepared based on or refer to theories that correspond to areas of study researched and or refer to the relevant research result and ever performed or observed by others. Theoretical framework must include and demonstrate linkage variables to be studied completely and logically and it is possible to have dummy variables to clarify the relationship of variables to be studied so that the justification can be accounted for. To give clarity to the parties concerned in explaining the idea of ​​linkage research variables that are described in a diagram (figure) systematically. Determine the number of research variables and classify them into groups of independent variable and dependent variable. If there is any intervening variable, it has to be incorporated into the analysis model. The independent variable is declared with the notation X, and if there is more than one variable, it is denoted by X1, X2, … , Xn. Related variables are declared with the notation Y, and the intervening variable is declared with a notation I. This sub-section is to provide a clear operational definition of each variable of the research and to define the variable indicator and its unit size. This sub-section mentions and describes the type of data and the source of primary and secondary data acquisition. Mentioning the overall population members of the research object and determining the size of the population. If the research is a census research, it is not necessary to use sampling. Mentioning and explaining the data collection techniques used to obtain data that can be accounted for. Data collection techniques are observation, interviews, documentations, and questionnaires. It mentions the analytical methods to be used, qualitative and quantitative methods. Qualitative Methodsexplicitly mention the basics of the appropriate theory according to the study variables as a basis for analyzing (assessing and exploring the relationship between variables) on phenomena or symptoms that occur in objects of research so as to obtain the desired response by the research objectives. Mentioning and explaining completely, in detail, and systematically the design of analysis model that will be used for the research of hypothesis testing. Explaining the quantitative techniques (scoring) of qualitative data regularly and consistently. Stating the statistical hypothesis testing tool used and formulate statistical hypotheses (Ho and Ha) as well as explaining the criteria of the examiners. Chapter I: The Introduction contains the background, the identification of problems and issues, and the research objectives, the theoretical framework, the hypothesis, the research methods, and the systematic thesis. Chapter II: The theoretical foundation contains theories about the understanding the major field of study and the variables to be studied, theories explaining the relationship between variables and theories supporting the research. Chapter III:The presentation of data contains the development of the research object, the conditions of the object of study especially with regard to the problems studied. Chapter IV: The analysis of the data contains analysis methods used along some necessary explanations. Chapter V:The conclusions and suggestions contain the formulation of conclusions on the basis of the research results and provide some suggestions with regard to the conclusions. In this proposal it must be accompanied by a plan of references that will be used. In this proposal it should also be equipped with a list of questions / questionnaires / questionnaire or interview guidance. The page of introduction consists of a title page, advisors approval page, approval page, thesis abstract, curriculum vitae, dedication page, motto page, preface, list of tables, list of pictures, and list of appendices. The title page contains the following: thesis title, student name, Student number (NPM), symbol of UBL, University name, and the ratification of the thesis. The thesis approval page contains: thesis title, student name, Student number (NPM), study program, faculty, specialization, names of supervising committee, and the name of the head of study program. The approval page contains: names of the test team, dean’s name, and date of graduation. The contents and thesis abstract writing techniques are discussed in chapter 4 in this manual. Memoir contains: place and date of birth, name of parents or family, and history of education of the writer. Tribute Page contains: The dedication addressed to the parties seems necessary for the thesis writer. Motto Page contains: a motto of live of the writer for a maximum of 3. Thanks are addressed to specific parties, among others: The head of the Foundation, The Rector, The Dean, The Head of Study Program, The Commission Counselor, and The Head of Research Object. Place, date, month, and year of making. Table of contents includes systematics of the thesis (introduction page and the content of the thesis) and the page number. List of tables containingthe number of table, the table title, and the page number. List of figures contains the number of image, the image title, and the page number. Appendix contains number of attachment, text of attachment, and the page of attachment. Fill in the subs of the introductory of chapter Isimilar with the contents of the corresponding parts of the proposal. Example: the sub-section of 1.1 the background of the first introductory chapter is the same with part 1 of the proposal background and so on. Definition and restrictions as well as other explanations are considered necessary in the main study areas that are investigated. For example: the field of science studies examined is on The Listening Activity that Affects Students’ Understanding in English, so the sub-chapter should present the definition and limitation of The Listening Activity, The Listening Activity functions, and so on. Definition and constraints of research variables theoretically with the explanation of the variables in detail.For example: If the research that is conducted is examining on variables of work motivation and job performance, it needs to be presented in sub-chapter about the understanding of work motivation, principles of motivation, types of motivation, understanding and constraints of work performance, the factors that affect job performance, and other details about the motivation and job performance. Links between the studied variables either directly or indirectly theoretically. For example: the relationship of work performance with motivation, the role of material and non- material motivation to improve employee’s motivation, theory about the motive achievement by McClelland, Herberg motivation theory, and so on. General description of the object of study.It can be presented into sub chapters which essentially provide a general description of the object under study. For example: The history and development of the research object, the organizational structure of the research object, business and activities of research objects, and so on. If the research is conducted using secondary data, the secondary data must be presented intothe sub-section corresponding to the number of variables examined. For example: Research is conducted using two variables, work motivation and job performance. It means that it needs to present data on work motivation and data on work performance. If the research is conducted using primary data, it is necessary to present the primary data in the form of data ready for analysis after processing. In this chapter there are two possible alternatives of analysis used, the alternative qualitative alone or a quantitative analysis and a qualitative analysis that are appropriate to the methods of analysis that have been specified in the methods of analysis in Chapter I. When the first alternative is used, the presentation is not divided into sub-sections, but the contents of the sub-sections should be presented systematically based on the theoretical foundation which has been determined with the discussion completely that leads to the achievement of the research objectives. Describing the data to be analyzed based on the needs of analysis model used. Using the model in the form of calculation orderly to obtain the coefficient value. Consulting the coefficient valueswith the statistical valuesfor a statistical hypothesis testing (if it is used). Explaining the meaning of the coefficient values ​​and its interpretation. Providing the application of the interpretation of the relationship between the variables studied (implementation of interpretation). to express the basic reviews of the theory based on the theoretical foundation of chapter II that becomes the reference in the analysis that shows the relationship directly or indirectly between studied variables. to analyze the existing variables research condition on the object that has been designed. to present the discussion of the analysis results and its implementation in accordance with the research objectives. In the sub-section of the conclusions several pointsof conclusions that are essentially to meet the research objectives are presented. The conclusions should be based on the analysis result and discussion in chapter IV. The materials on conclusions are clearly and concisely formulated containing conditions of the study variables on the object of the research, the relationship between the study variables (the relationship, the influence, or the role), and a discussion of the results of hypothesis testing. In the sub-section of suggestions some pointsof suggestions as alternative implementations for the benefit of both the object of the research and for the development of science are presented. The suggestion should be based on the conclusions that have been formulated in the sub-section of conclusion chapter. Suggestions materialsare formulated clearly and concisely as well as operational which contains alternative solutions on the object of the research. Provisions of thesis writing techniquesare classified into two parts, general provisions and special provisions. Paper used to present the thesis is distinguished between the paper for the cover and the paper for the content (text) of the thesis. The cover of the thesis that is ready to be tested uses a gray “buffalo” paper. The cover for a thesis that has been tested and declared passed uses the material of gray “hard cover”. The paper size for a thesis is A4 (80 grams) or 21.0cm x 29.7 cm. Thesis writing must be done using computer or printed. The font is “pica” and the font size is 12 for all letters except the thesis title on the cover, which is bigger (16), and subscript and superscript which is 10. The space for the body of thesis is 2 (double space), and the space for the abstract and bibliography is 1 (single space). There is a bigger space, however, between entries in the bibliography. Write-off and blackening the wrong part is not allowed, the removal must be clean and perfect. The writing of all texts in general should use double spacing. Single space is used for writing the title of the table, title image, abstract, direct quotes, and sources of literature on bibliography. The paragraph writing should begin from the left margin, not indented. The next sentences in the same paragraph should not be begun on a new line. The thesis shall use StandardEnglish with correct structures based on the general guidelines. English Spelling and English sentences are arranged in a good way and in a correct way. Multiplication can be done by copying using specified ink and paper. The thesis that is ready to be tested is multiplied by 2 copies (1 printed + 1 CD). The numbering in the introductory page uses small Roman numerals (i, ii, iii, and so on) that are placed in the middle of the lower margin. The numbering of pages in the body of the thesis, a bibliography and appendices, uses Latin numerals, and they are placed in the upper right, two spaces above the upper margin and 3 cm from the top right edge on the page containing the main title (chapter). The page numbers are listed in the middle, two spaces below the bottom margin. a) The numbering of chapters uses roman numerals (Chapter I, Chapter II, and so on). The numbering to declare the lower division (five points) should use Latinnumerals followed by the closing parenthesis. For example 1), 2), ………., and so on. For the next lower division (six numbers) the numbering should use Latinnumerals in parentheses. For example: (2),(3),………., and so on. Tables, images, and appendices are given the sequence number using Latin numerals. d .The numbering for the distribution of non-sub-section (for instance details of a theory) should use lowercase letters of Latin. For example: a., b., …….,and so on. If the details require further details, the writing of the details is as follows: a), b), ………., and so on, and if you still need more details, then the writing is: (a), (b), …….., and so on. Citation consists of two forms, direct citation and indirect citation. Direct citations are taking an idea / notion / understanding of the full written sources without changing the shape and editorial. Indirect citations are taking the essence of the idea / notion / understanding or taking an idea / notion / understanding that are expressed in a different editor. a) If the citation consists of at most three lines, then place it as part of the sentence in the text between the two quotation marks written in double space (two spaces). ………………………. positionspecification is prepared. “Position specification is a description of the minimum requirements of office personnel to be able to hold a certain position, so that he can work effectively”. b) If the citation is more than three lines, then place it between quotation marks below the last two lines of the sentence that precedesit, indented five letters of the left margin in single-spaced typing. …………….. differentiate the definition of organization in two terms, namely in terms of a dynamic organization and the organization in a static sense. ” Organizations in the dynamic sense is a process of defining and sharing the work to be done, limiting the duties or responsibilities and authority and the determination of the relationships between the elements of the organization, thus enabling people to work together as effectively as possible to achieve the goal. a) The Source of citations must be in order: author’s name (the title), coma, year of publication, a colon, and the page number of the citation written and placed within brackets after the quote. ” ………. ” . (Edward III, George: 86-96). ” …………… ” . (PholipKolter in the book of BasuSwastha, 1979: 33-34). Bibliography is written in capital letters without the quotes, with no bottom line, in the middle of parallel sheets, 6 cm from the top edge. 3.1.2.3References are written single-spaced, the second row is written indented into as many as 8 beats from the left margin. The distance between the two literature sources are two spaces. The writing of an author’s name does not use degrees of education. If the library source comes from a textbook, then the title of the book is italicized. References are written based on alphabetical order of author’s name. The name of the author is written with the first name comes after the last name proceeded by a comma. Atkins, B.T.S. and Roundel, M. (2008), The Oxford Guide to Practical Lexicography, New York: Oxford University Press. Dirk, G. (2010), Theories of Lexical Semantics, New York: Oxford University Press. Two persons, all names should be separated by the word “and”. Three persons, all names should be separated by the word “and”for the first and the second names and a comma for the third name. More than three people, then only the author of the first order is written by adding the words “et. al.”. If there are several sources of literature authored by the same author, they are written sequentially starting from areference that is first published. Taneko, Soleman B., 1988, Strukturdan Proses Sosial, SuatuPengantarSosiologi Pembangunan,Jakarta, Rajawali Press. Taneko, Soleman B., 1994, SistemSosial Indonesia edisikedua, Jakarta CV. FajarAgung. In the case of the same year of publication, the library source is written in order of citation by stating the Latin alphabet behind the year of publication. Wahjosumidjo, 1998, Kepemimpinan Dan Motivasi, Jakarta, Ghali Indonesia. Wahjosumidjo, 1998, MotivasidanPenerapan, Jakarta, DepartemendanKebudayaan,pusatpendidikandanlatihanpegawai. Drackova, Jana, (2009), English Language and Literature by Semantic Analysis of Adverbs of Degree, Bachelor’s Diploma Thesis. Masaryk University, Faculty of Arts, Department of English and American Studies. Seris, Pavol,(2008), On Cognitive Synonymy: A Case Study Adverbs of Frequency, B.A. Major Thesis, Masaryk University, Faculty of Arts, Department of English and American Studies. Kuncoro, T. (1996), Pengembangan Kurikulum Pelatihan Magang di STM Nasional Malang Jurusan Bangunan, Program Studi Bangunan Gedung: SuatuStudi Berdasarkan Kebutuhan Dunia Usaha Jasa Konstruksi, Tesis tidak diterbitkan, Malang: PPS IKIP Malang. When a reference is derived from a non-textbook (articles in newspapers or magazines, journals, dictionary, encyclopedia, act, and so on), the article title or the title of a journal is written in italics. Rahmawati, B. (10 Mei, 2013), Unsur penting dalam penulisan daftar pustaka, Majapahit Pos, hlm. 2 & 6. Merriam-Webster (2008), Merriam-Webster’s Collegiate Dictionary 11th ed. San Jose CA: Fog Wave Publishing. Stafford-Clark, D. (1978), Mental disorders and their treatment, The New Encyclopedia, Chicago, USA. Republik Indonesia, (2003), Undang-UndangSistemPendidikanNasional, Jakarta: Sekretariat Negara. If the reference comes from internet sources, the site should be written completely followed with the date of the accessed site that is placedinside the brackets. Online Oxford English Dictionary (OED): Available on http://english.oxforddictionaries.com/definition/convince/. (Accessed on 12 February 2013). Davies, M. (2004), BYU-BNC: The British National Corpus, Available online on http://corpus.byu.edu/bnc (Accessed on 15 March 2013). If the reference is from a film or movie, what is written down is the name of the producer, the year of publication, the title of the movie in italics, the production house, the country of origin, and the length of time. Oldfield, B. (Producer) (1977), On The Edge Of The Forest, Tasmanian Film Corporation, Hobart, Australia, 30 minutes. Thesis abstract is a research report presented in a clear, concise, and packed so that the reader can understand the main content of the thesis without reading the essay as a whole. Sequentially, thesis abstract contains a title, the name of the researcher, supervising commission, a brief description of the problem, research objectives, research methods, the results of the data analysis, and conclusions of research data. The word ‘abstracts’is written in capital letters without quotes and without the underline in the middle of the first line of the paper (6 cm, from the top margin). It is typed in a single space and not more than two pages. Academic requirements to follow the comprehensive exam are the completion of the entire curriculum (except paper) and a minimum of 2.00 GPA by submitting a letter of evidence of academic scores ​​independently that have been approved by the head of the study program. Students have completed the thesis preparation by submitting the approved thesis by the supervisor to be tested. Enrolled as a student as evidenced by showing a copy of the last student card or a proof of re-registration. Free from financial administration by submitting the proof of payment from the university treasurer. Completing other conditions as determined by the faculty (graduate certificate of PPK). One day before the exam students must have already known the schedule, the place, and the time of the exam. No later than 15 minutes before the exam starts, students should already be in the exam place. The team leader is the main supervisor; If the main supervisor is unable to come, the position is replaced by the second supervisor. has a degree of doctorate education (S3). At least two members of the board of examiners have the same discipline background with the participant. The team leader is in charge of opening the hearings / exams, organizing and directing the examinees as well as closing the session. Secretary is in charge of preparing for the test file, noting the incident. The main examiner: To test with more emphasis on research methodology. The second examiner: To test with more emphasis on the theoretical aspect. The Team leader:To test supportivematerial aspects with more emphasis on theoretical and politicalstudy related with disciplines of the participant. 45 to 60 minutes for the main examiner. 30 to 40 minutes for the second examiner. 15 to 20 minutes for the team leader. The nature of a test is a comprehensive one; it means that the examinees are required to master the thesis along with the theory and the application of the chosen field of study. The thesis mastery will be seen from the aspect of methodology, theoretical foundation, and thesis writing procedures. During the exam, participants have the right to answer or respond to the questions posed by the examiners team both in speaking and in writing if desired. Suggestions for the improvement of the thesis will be summarized by the secretary of the board of examiners in accordance with instructions of the examiners team. Before the exam is over, the examinee must sign a statement of authenticity of the thesis and the ability to improve the thesis in accordance with the specified time. The scoring of the exam consists of mastery of the material elements of the exam,ways of expressing as well as the attitude shown during the exam. Decisions made by the examiners team about passing the test are absolute and inviolable. Comprehensive exam results will be announced after the comprehensive exam ends. For examinees that are not present at the announcement of the comprehensive exam results, the announcementis suspended subsequent to the implementation of a comprehensive exam. Examinees immediately contact the faculty to take the form of the thesis repairs regardless of passingthe exam or not. It is precededwith the process of the thesis repair in accordance with the instructions of the thesis repair. Then the examinee shall contact the board of examiners to obtain the repair instructions. If the thesis repair has been approved, the board of examiners gives a stamp of approval on a form of improvement. If a participant does not pass the exam, then the participant is required to follow the procedures in accordance with the previous procedures. Participants who do not pass the exam should meet the board of examiners and supervisors for guidance or repairs of the thesis before performing a re-comprehensive exam (repeat). Students who will repeat the comprehensive examination must show evidence that they have met the board of examiners and the supervising committee and has been approved to re-take the exam. If participant is declared to pass the exam, then after getting the approval of the board of examiners on the improvement of the thesis with evidence of approval of repairs, the examinee has to print and reproduce as many as 1 copy of thesis and 1 copy in CD.